An Environmental Impact Assessment (EIA) can be described as a systematic process to identify alternatives to and the potential positive and negative impacts of both a proposed activity and the feasible alternatives on the environment (biophysical, socio-economic and cultural). From the assessment of the proposed activity and the feasable alternatives, management (or mitigation) measures to minimise the negative consequences and optimise the positive consequences are developed. 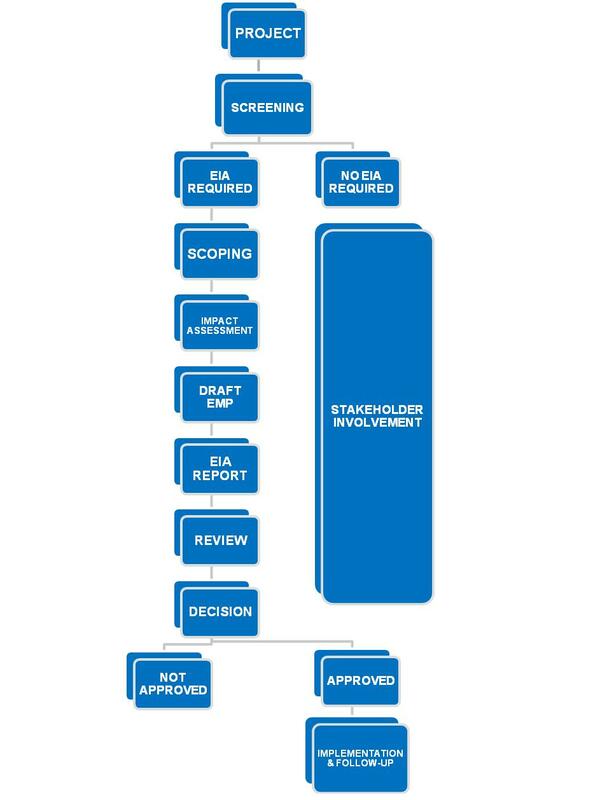 Screening can be defined as the process that determines the need for and the scale of an EIA. It is important to distinguish which projects require an EIA or not. There is no formal screening report required but two documents need to be submitted before an EIA is undertaken, these being, a notice of intent to submit an application and an application for authorisation. Scoping is the identification of a number of important issues from a wide range of potential problems that have to be addressed in the EIA. It not only identifies important issues but also eliminates unimportant issues (little or no concern) that drain human and financial resources. Scoping always involves interaction between all stakeholders (Interested & Affected Parties – I&AP’s) to identify key issues for investigation. During this phase the impact of the activities of the proposal on the various components of the environment is identified. All the activities throughout the entire project cycle (pre-construction, construction, operation and decommissioning) must be included. Both negative and positive impacts should be assessed. Wild Route Environmental Consultants CC’s primary member is registered as an ecologist with the South African Council for Natural Scientific Professions (SACNASP), which regulate scientific and professional standards within the industry and can assist with specialist ecological (faunal and floral) surveys for EIA’s. Although we do not run the whole EIA process, we do work in association with companies that specialises in EIA’s. Contact us for more information.